SAN FRANCISCO, CA--(Marketwired - Jun 8, 2015) - A major feature film starring Om Nom, the lovable green monster from the massively popular "Cut the Rope" mobile game franchise, is set to appear in theaters worldwide late next year. Tentatively titled "Om Nom," the film will feature an all-new story exploring Om Nom's beginnings, presenting the cute little character in ZeptoLab's iconic, 3D cartoon style. Originally launched in 2010, "Cut the Rope" games have been downloaded more than 700 million times by users around the world, in addition to winning several industry awards including Best Handheld Game and the Apple Design Award. The franchise has expanded into multiple merchandise categories and spawned a series of online short-form animated stories that have logged over 600 million views to-date on YouTube and in-game video player. With his popularity around the world and across all age groups, Om Nom, the star of "Cut the Rope," has become one of mobile gaming's most recognizable characters. "Om Nom" tells the story of 13-year old Evan, a boy whose impulsiveness leads him to open a secret package containing a living scientific experiment -- with mischievous intentions! Known only as Om Nom, this adorable creature has an insatiable appetite for everything sugary. Now free to roam, Om Nom begins to wreak havoc upon this formerly quiet town, and Evan, with his little sister Jordan in tow, must follow him on an epic adventure while avoiding a host of government agents, shady characters and other unique creatures -- all of whom are looking to capture Om Nom for themselves. Along the way, Evan and Om Nom will discover the importance of trust and patience, and how life's accidents can sometimes lead to incredible discoveries and unforgettable moments. "Om Nom is the cornerstone of the 'Cut the Rope' series and his story is inseparable from the gameplay," commented ZeptoLab Creative Director Semyon Voinov. "Of course, it's not always possible to include a full plot and character development in a mobile puzzle game, which is why we created the 'Om Nom Stories' YouTube series. These have been so successful that a full-length animated movie was a logical continuation, and also a great opportunity to tell Om Nom's story to as many people as possible." The film will be produced by Blockade's CEO Brad Foxhoven and VP of Development David Wohl, with Zeptolab's CTO Efim Voinov and CCO Semyon Voinov serving as Executive Producers. "Through their online stories and games, Zeptolab has been able to build an expansive world filled with engaging characters and stories. The film will build on Om Nom's origin, and stay true to the unique look and personality that the fans have grown to love," said Foxhoven. "Video games became a major part of mass culture a long time, but there's still a lack of good specialists who are able to transfer them to the big screen," said ZeptoLab CEO Misha Lyalin. 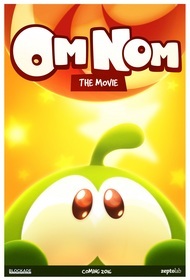 "With this movie, we want to give our fans a deeper experience with Om Nom than ever before. With a great record with movie adaptations of video games, Blockade was clearly the right partner for us. They know how to make an interesting film without losing the spirit and the style of the original." ZeptoLab is a global gaming and entertainment company best known for developing the award-winning, hit franchise Cut the Rope®, which includes Cut the Rope, Cut the Rope: Experiments, Cut the Rope: Time Travel and Cut the Rope 2, available across platforms and devices. Cut the Rope games have been downloaded more than 700 million times by users around the world since the game's debut in October 2010. The company has also released Pudding Monsters™ and King of Thieves, available on Android and iOS platforms. For more information, please visit www.zeptolab.com. ZeptoLab, Cut the Rope, Om Nom, Nommies and Feed with Candy are the trademarks of ZeptoLab UK Limited. TM/© 2015 ZeptoLab UK Limited. Blockade Entertainment is an independent film and television production company. Following a strategic deal with Sony Computer Entertainment, Blockade has currently wrapped production the Ratchet and Clank, a CG-Animated theatrical film slated for worldwide release with Focus Features on April 29th 2016. The film features an all-star cast that includes Paul Giamatti, John Goodman, Sylvester Stallone, Bella Thorne, and Rosario Dawson. The company is also in production on Sly Cooper, based on the Sony PlayStation game franchise, and released Heavenly Sword, a direct to DVD CG-Animated film in 2014. www.blockade.com.